Yamaha student flutes aren’t just common production flutes made with cheaper materials and less quality control. Rather they are designed from the outset as student instruments that accommodate the particular needs of a beginning player. The Yamaha YFL-262 is a fine example of these kinds of considerations. The YFL-262 features a lip plate designed to guide beginners toward proper breath utilization, as well as keys with carefully considered dimensions and angles for optimum balance and easy playability. It reflects a blend of leading technology and craftsmanship, and will give any student every opportunity to excel. New refinements include pointed key arms contributing to elegant visual appeal, and a completely revised key parts manufacturing process that significantly enhances overall playability. Specifically designed for a clean attack, sensitive response, and accurate intonation. The offset-G key configuration offers a natural feeling hand position. 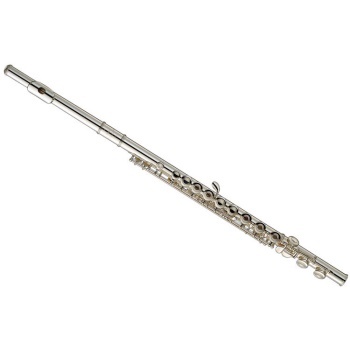 Student flutes come with a plastic case that will withstand the rigors of school use.